WW II Buffs will find this interesting. Even after 62 years (and a little tinkering), they were able to fire up the diesel engine ! 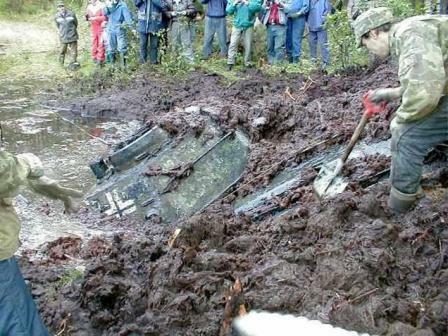 A Komatsu D375A-2 bulldozer pulled the abandoned tank from its tomb under the boggy bank of a lake near Johvi, Estonia. 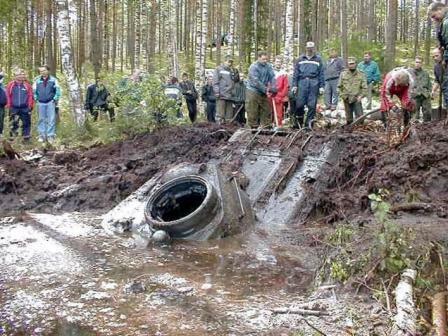 The Soviet-built T34/76A tank had been resting at the bottom of the lake for 56 years. According to its specifications, it's a 27-ton machine with a top speed of 53km/hr. From February to September 1944, heavy battles were fought in the narrow, 50 km-wide, Narva front in the northeastern part of Estonia . Over 100,000 men were killed and 300,000 men were wounded there. During battles in the summer of 1944, the tank was captured from the Soviet army and used by the German army. (This is the reason that there are German markings painted on the tank's exterior.) On 19th September, 1944, German troops began an organized retreat along the Narva front. 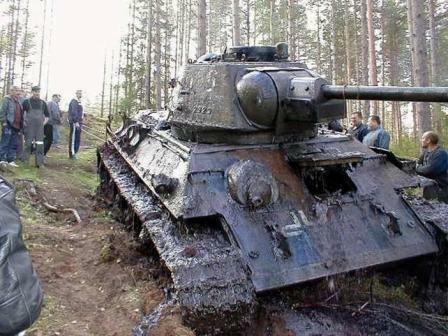 It is suspected that the tank was then purposefully driven into the lake to conceal it when its captors left the area. At that time, a local boy walking by the lake, Kurtna Matasjarv, noticed tank tracks leading into the lake but not coming out anywhere. For two month s he saw air bubbles emerging from the lake. This gave him reason to believe that there must be an armored vehicle at the lake's bottom. A few years ago, he told the story to the leader of the local war history club 'Otsing'. Together with other club members, Mr. Igor Shedunov initiated diving expeditions to the bottom of the lake about a year ago. At the depth of 7 meters they discovered the tank resting under a 3 meter layer of peat. Enthusiasts from the club, under Mr Shedunov's leadership, decided to pull the tank out. In September of 2000 they turned to Mr. Aleksander Borovkov, the manager of the Narva open pit company AS Eesti Polevkivi, to rent the company's Komatsu D375A-2 bulldozer. The pulling operation began at 09:00 and was concluded at 15:00, with several technical breaks. The weight of the tank, combined with the travel incline, made for a pulling operation that required significant muscle. The D375A-2 handled the operation with power and style. The weight of the fully-armed tank was around 30 tons, so the active force required to retrieve it was similar. A main requirement for the 68-ton dozer was to have enough weight to prevent slippage while moving up the hill. After the tank surfaced, it turned out t o be a 'trophy tank' that had been captured by the German army in the course of the battle at Sinimaed (Blue Hills) about six weeks before it was sunk in the lake. Altogether, 116 shells were found on board. Remarkably, the tank was in good condition, with NO RUST, and all systems (except the engine) in working condition. This is a very rare machine, especially considering that it fought both on the Russian and the German sides. Plans are underway to fully restore the tank. It will be displayed at a war history museum in the Gorodenko village on the left bank of the River Narv.